It is with great pleasure that the CFO announces the installation of the Psi Tetraton Charge at the University of Arizona on Saturday, February 11, 2017. 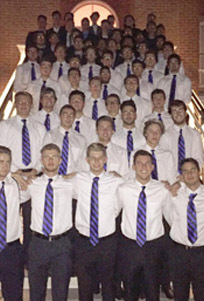 We are excited to welcome 44 men into our brotherhood. The Colony has worked diligently over the last year and a half to establish themselves on-campus and prove that they are worthy to be called ‘brother’. The chartering banquet is at the Tucson Marriott University Park, 880 E. 2nd Street. Tickets to the event are available below. The banquet will include a plated dinner, cash bar, and program. We welcome any Theta Delts that can attend this special event to register now!